Lac-Mégantic Blast Leaves Impact On Town, Rail Industry In early July, a train carrying American crude oil derailed and exploded in the heart of a small Canadian village. The deadly accident in Lac-Mégantic, Quebec, and its aftermath have triggered a wave of lawsuits and a sweeping review of rail safety standards in the U.S. and Canada. Crews are scrambling to clean up toxic contamination in Lac-Mégantic, Quebec, and many locals have been forced out of their homes and businesses for at least a year. Three months ago, a train carrying American crude oil derailed and exploded in the heart of Lac-Mégantic, Quebec, killing 47 people. Local leaders now say recovering from the disaster will take much more time, effort, and money than they expected. Industry experts say the accident could change the way oil and other dangerous chemicals are transported on trains in North America. "It's been left for weeks, everybody quit so fast," says Robert Mercier, head of Lac-Mégantic's environment department, as he walks down his town's main street. He grew up here. In a normal year, he says, the street cafes and tourist shops would have been busy with visitors who come to see the colorful fall leaves. Now, it's a ghost town. People fled in the early morning of July 6 as massive fireballs rolled into the sky. Mercier says he was sleeping in an apartment nearby when the first tank car erupted in flames. 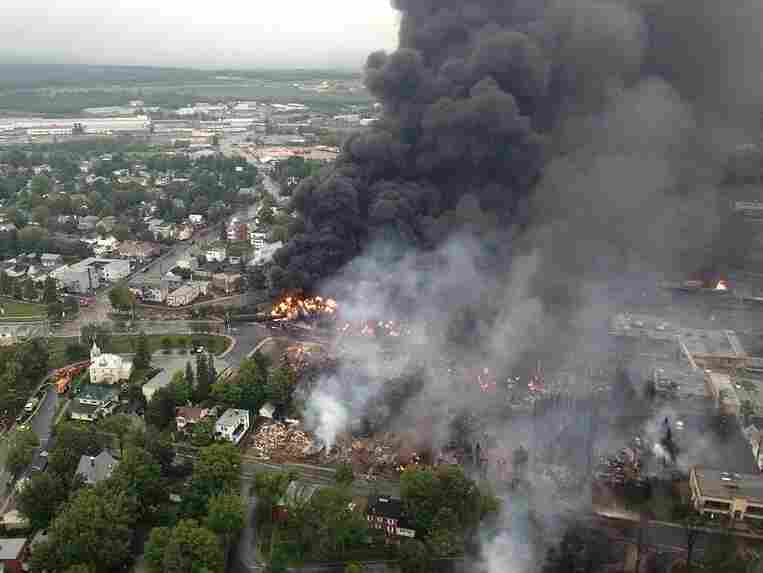 People fled Lac-Mégantic early the morning of July 6 as massive fireballs rolled into the sky. "We just didn't know what it was — volcano, meteorite, what is that? Once you don't know, you're just afraid. You just run. You run," he says. A few weeks ago, locals loaded computers, mementos, and furniture onto U-Haul trucks before the city was closed off for at least a year. Parts of the city were flattened by the blast. 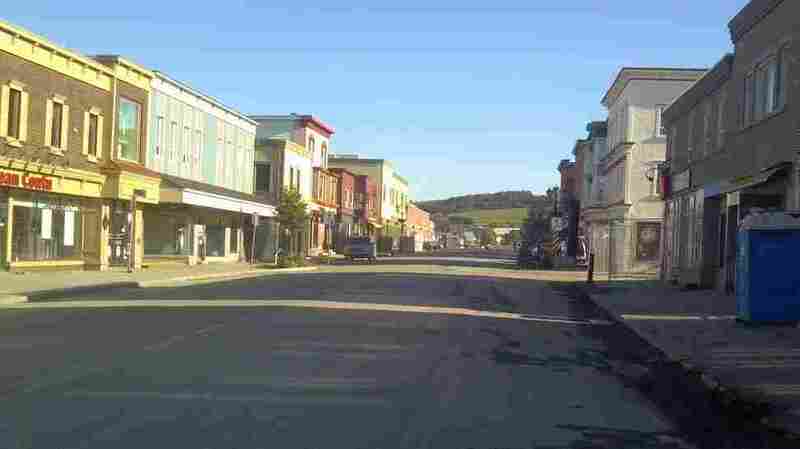 Underneath the remaining buildings, cleanup crews have discovered that much of Lac-Mégantic's downtown is saturated with heavy metals — lead, arsenic, copper — and that thick crude oil. Three months after the explosion, they are still pumping spilled crude oil and chemicals from underneath what used to be a gorgeous lakefront street. In his office, Mercier spreads out a map on his desk, showing the vast scope of the cleanup. "So, the petroleum mostly flew on the ground, on this side to the lake. So, the lake was burning for a big part," he says. "That was something to see, yeah? You can see here, all the landscape in this area is destroyed ... all these houses are gone now. Nothing there, nothing there." A fleet of huge trucks and backhoes is laying the foundation for an entirely new downtown. Officials have decided that a new business district is needed to replace what's been destroyed or contaminated. About $116 million has been pledged for that effort, but no one's sure what the final price tag will be. The province of Quebec and Canada's national government are feuding over how much to spend and who should pay. Caught up in this turmoil are people like Guy Boulet, who owns a furniture store just outside the contaminated zone. His sister, Marie-France, died in the fire-storm. 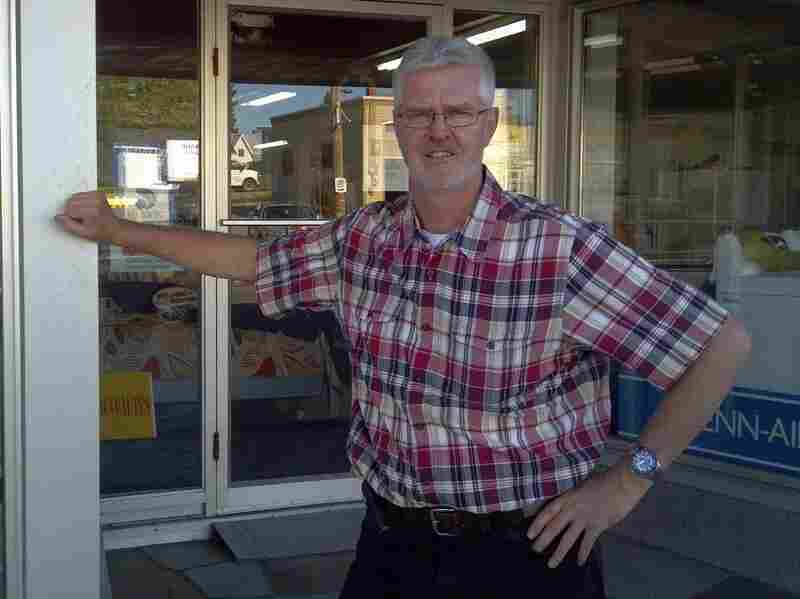 Guy Boulet owns a shop in Lac-Mégantic. His sister, Marie-France, died in the explosion. Weeks later, Boulet sits behind the counter in his shop. He looks exhausted. Marie-France's remains have never been recovered from the wreckage. After a long day spent making deliveries, trying to get his life back to normal, his family is finally preparing for his sister's remembrance. "It's a simple ceremony right at the church," he says. "She was a really good person." Boulet says people here are resigned to the idea that the healing process will take a long, long time. "We have to be really patient. Because nobody knows exactly how long it will be. We hope nobody forgets, you know, because we will need help. We need help," he says. Adding to the pain and frustration, a growing number of experts and government officials in the U.S. and Canada say that there were plenty of warning signs long before disaster struck. Robert Mercier, Lac-Mégantic's environment officer, says his office tried to raise questions about the Montreal, Maine and Atlantic Railway and its growing shipments of hazardous oils and chemicals. "We were very worried about the conditions of the rail — we were talking about that many times," Mercier says. "It was a great concern about the train and the condition of the rail and all these tanks that were passing every day." Since July, investigators in the U.S. and Canada have focused on a wide range of red flags — from the condition of the tracks, to the staffing level of these big industrial trains, to new evidence that the hazardous chemicals aboard the Lac-Mégantic train were mislabeled. 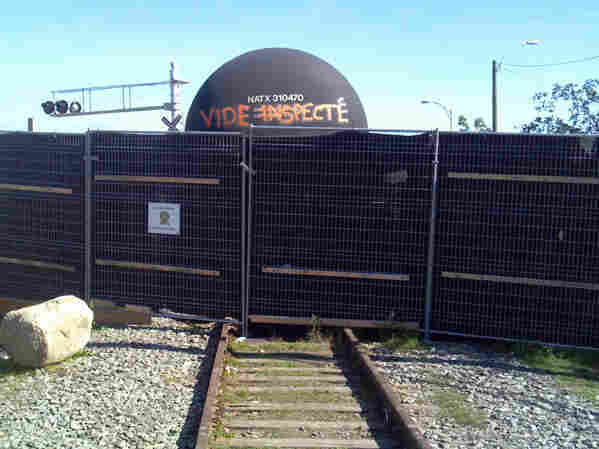 The workhorse of the rail industry, a DOT 111A tank car sits on the outskirts of Lac-Mégantic's destroyed downtown. But much of the scrutiny has fallen on the type of freight car that erupted that day — the big, sausage-shaped tank car known in the industry as a DOT-111A. "It's rigid, it's prone to derailment, and when it derails because of the coupling design, they're prone to puncture," says Lloyd Burton, a professor at the University of Colorado who studies rail transport of hazardous materials. It turns out DOT-111A's make up two-thirds of the tank cars used in the U.S. and Canada — they're like the workhorse of the rail industry. Thousands of them roll through towns and cities across America every day. And Burton says they're carrying increasing amounts of increasingly volatile crude oil and chemicals produced by North America's booming energy industry. "The most dangerous crude, the highest sulfur crude, the most explosive and most flammable materials are being carried in tank cars," he says, "And they're being carried in tank cars that are simply not equal to the task." For decades, the U.S. National Transportation Safety Board has been issuing strongly worded reports about the safety of these very same DOT-111A's, calling them "inadequate" for carrying "dangerous products." Despite those warnings, the rail industry has resisted replacing its tank car fleet. Newer double-hulled cars are expensive and railroad executives have argued that freight trains overall have a strong safety record. But last month, the CEO of one of North America's biggest railroads signaled a major shift. Speaking on the Business News Network, Hunter Harrison — head of Canadian Pacific — said the disaster in Lac-Mégantic had changed the debate over DOT-111A's. "Well, I think they'll be phased out as far as dangerous commodities. We're much more, rightfully so, sensitive about the environment today than we were when these cars were built," he said. "Shame on us as society." Experts say phasing out DOT-111A's in North America would take at least five years. Last month, the U.S. Department of Transportation launched a new rule-making process that could determine once and for all whether the industry will be forced to replace its tanker fleet. That review is now on hold because of the government shutdown in Washington.